May 21, 2014 -- It seems illogical in a sport in which cars routinely accelerate from zero to 120 miles-an-hour in less than one second, but on the eve of this week’s 27th annual Kansas Nationals at Heartland Park-Topeka, Mello Yello title contender Steve Torrence insists that sometimes you have to slow down in order to speed up. That’s been one of the issues this year for the 31-year-old Texan whose Capco Contractors hybrid has been one of the quickest and fastest Top Fuel dragsters on the NHRA pro tour – at least through the first two rounds of racing. 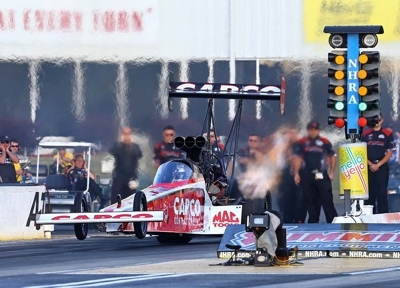 Indeed, even though he failed to advance to the money round again last week at Atlanta, Ga., he at least had a chance to beat point leader Doug Kalitta in the semis before dropping a narrow 3.811-to-3.830 decision. “We went A to B and didn’t beat ourselves,” Torrence said, “and that’s a big step. The other two times we raced Doug, we couldn’t calm it down enough and we just overpowered the track (and lost traction). “We’ve got a damn good hot rod right now and we’re just gonna try to ride this momentum as far as it takes us,” said the graduate of Kilgore College. “We’ve been making small adjustments and fine-tuning our clutch set-up and the (clutch) discs we have and the configuration we’re running right now obviously is working. Still, Torrence knows that as long as crew chief Richard Hogan and his team keep putting him in position, he eventually is going to start winning races again. “I like these back-to-back races,” Torrence said of the current set of three events in success, “because you stay in the “zone” the whole time. You’re only out of the car a couple days between races. I flew back to Kilgore Monday night (after Atlanta), slept in my own house and then caught a 7 o’clock flight out on Tuesday morning.